Emergency phone service around campus has been restored, or at least two-thirds of it has. 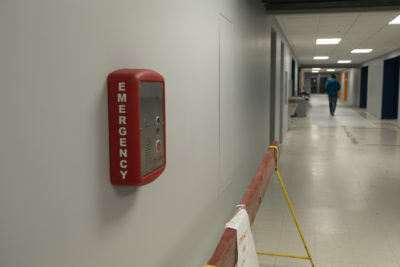 After faults and malfunctions were discovered with the existing Code Blue phones in the summer of 2017 when a TRU staff member had to make a first aid call on a non-functioning phone, an investigation was launched and was reported in February’s Board of Governors meeting. TRU has since taken action to restore and install new emergency phone systems around campus. 35 new units were purchased for indoor campus facilities, 21 of these units or roughly two-thirds of which, have been installed already. The remaining units still have to be programmed by TRU’s Information Technical Services but are slated to be installed by 2019, meeting the expected deadline. “All the new phones use Voice Over Internet Protocol. That’s a huge difference from the previous technology with the Code Blue phones and that decision was made after extensive independent research into looking at what could be the best solution for TRU,” Spoke Juli Holloway, the Executive Communication Specialist for TRU. As indicated by previous proposals, these new units are 50 per cent more cost effective than previous Code Blue units. The new Talkaphone units come from a U.S. provider, but are locally distributed in Kamloops, with tech support coming from Vancouver to do any future repairs if needed. The new units also come with an extended four-year warranty in addition to their upgraded customer support and exceptional quality. To ensure that the units are consistently operational, monthly inspections will be conducted to test the integrity of new and old emergency phone units. The older outdoor Code Blue units have been updated to the new VOIP system, repaired as needed and deemed reliable. They will continue to have a presence on campus in addition to the new indoor units.